Precious little is known about the previous instruments in the Cathedral. The first organ was a mechanical tracker action instrument installed in 1846 by Matthias Schwab of Cincinnati, a leading organ builder of that time. Reported in the newspapers as the largest instrument in the country, it consisted of 3 manuals with either 43 or 44 ranks and 2717 pipes. It included a 32' rank (set) of pedal diapasons with the largest pipe weighing 400 pounds. It was located in the east gallery of the Cathedral and the case measured 28' X 25'. No information exists on the stop list for this organ. In 1891 a new device, the water motor, was installed to replace the arduous manual pumping needed to wind the organ. This did not last long since the device tended to freeze up in winter. In 1899 the Schwab organ was replaced by a Farrand and Votey (Op. 875) built in Detroit. This was a tubular pneumatic organ of 3 manuals and 42 ranks powered by an electric motor. Again, no stop list was preserved. Information is lacking about its disposition in the early 1950s when the Cathedral renovation began and it may no longer have been in use since a small Austin organ had been installed in 1927 at the north end of the sanctuary, approximately where the Baptistry Chapel is located today. This Austin of 2 manuals and 17 stops (renumbered Op. 1576) was originally built for Notre Dame Academy (Mound and Court Streets). After being used in the Cathedral, it was moved to the Aula Magna (Great Hall) of Mount Saint Mary Seminary, Norwood. By the time the seminary moved to Mount Washington much of the pipe work had been dispersed to other organs. A console still exists in Saint Matthew Church, Norwood. The present instrument was installed by Austin Organs, Hartford, Connecticut, (Op. 2236) in 1957 with the completion of the renovation of the Cathedral. This organ had about 50 ranks and 6 octave extensions. Two tonal additions were made in 1976, a Cymbal III mixture in the swell division and an 8' extension of the pedal Bombarde on the great division. With the deterioration in recent years of the more than 850 leather pneumatic actions, the decision was made to totally rebuild the organ, replacing all obsolete leather components with direct electric pipe valves and replacing all the old electro mechanical combination and switching units with solid state electronic components. The organ can now use all existing pipe work much more efficiently and the stop list has been expanded to 87. Two electronic bass octave extensions have been added along with 145 pipes (including an 8' swell Vox Humana stop, the gift of an anonymous donor). Two identical three manual consoles control the organ; they are located at the end of the south chancel gallery (on the left facing the sanctuary) and at the left rear of the sanctuary. 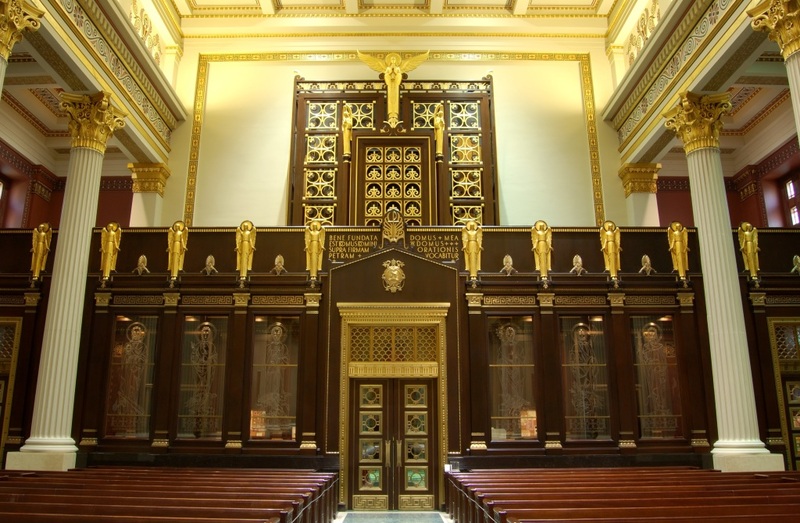 It has four manual divisions: the swell and great divisions are in the north and south chancel galleries, the choir and antiphonal divisions are in the east or rear gallery. Pedal division pipe work is at both ends of the building. The nine month rebuild project was performed by Schaedle Pipe Organ Services of Cincinnati beginning in January, 1987.